Big Five, one of the leading software producers for the TRS-80, has introduced its first Atari 400/800 arcade game, Miner 2049'er. When I heard that the folks at Big Five were attempting to write an Atari program, I was a bit skeptical. After all, these guys know the TRS-80, not the Atari. After playing Miner 2049'er, I realized that my worry was for naught--Miner 2049'er promises to be one of the most popular Atari programs in any software library. Miner 2049'er is written entirely in machine language by the president of Big Five, Bill Hogue. The whole program is crammed into a huge 16K ROM cartridge. When you first see Miner, you can't help making comparisons between it and Donkey Kong. Miner 2049'er is similar to Nintendo's coin-op game in that they are both multi-level games in which the player jumps and scuttles about on a building framework. From there on, Miner proves to be much more than a variation of Donkey Kong. Whether you are playing a one- or two-player game, your character, Bounty Bob, is controlled using one standard Atari joystick plugged into jack 1. To move Bob left, right, up, or down, simply point the joystick in the appropriate direction. To jump straight up, press the red fire button. If you want to jump from one place to another, you must be moving in the direction you want to jump when you press the button. 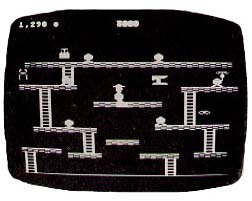 Whereas Donkey Kong has only four screens, Miner has a stupefying ten separate boards, each with a different scenario. In general, the object is to control Bounty Bob and "claim" all of the mine stations. Whenever you walk along sections of framework in the mine, the pieces under your feet will turn solid in color. To claim a station and advance to the next one, you must fill in every section of framework. Bounty Bob can die in a number of ways, the most common of which is to run into a mutant organism. These creatures roam the mines in hopes of making your visit a short one. Falling too great a distance will also prove lethal, as will miscalculating a jump. In addition to the deadly mutant creatures, every mine station has specific hazards that you must avoid (such as pulverizers, explosives, and slides). Scattered throughout the mine are various articles that have been lost by previous expeditions. To grab these objects, simply touch them. Points are awarded, and for a short time the mutants will turn green. While green, a mutant dies if you touch it. As if dealing with all of these dangers is not enough, poor Bounty Bob must also race against time. Located at the top center of the screen is the "Miner Timer." If this timer reaches zero, Bob dies. Should you complete the station before time runs out, you are awarded the number of points remaining on the timer. The limited sound effects are probably the weakest part of Miner. That is not to say that the audio is poor; it is just not up to the current standards for the Atari. Let's give a novice Atari programmer a little time to learn some of the better tricks for producing exhilarating sound effects. The graphics in the game of Miner are detailed and very colorful. To guard against repetition, the color of the framework changes from station to station as well as from game to game. One of the most dazzling visual effects I have seen on the Atari is the animation of Bounty Bob dematerializing as he teleports from platform to platform using the elevators. Miner does not push the Atari to its full graphics potential, but it more than makes up for that in its limitless playability. As mentioned earlier, Miner 2049'er has ten independent mining stations (game boards). The first three sections are fairly easy to complete with practice, but the game gets much more difficult after that. Luckily, Bill sent me a copy of Miner that allowed me to "skip" to any station I wanted. If I hadn't received this special version of the program, I doubt that I would ever have seen what lies beyond the fifth station. If you are skillful enough to accumulate a high score, you can add your name to the high score table. Unfortunately, the scores disappear when you pull the cartridge from the slot. A multitude of stations and ever--increasing difficulty make Miner a game that is virtually impossible to master. Miner 2049'er is a great game--no doubt about it. After reviewing Bill Hogue's first Atari program, I can't wait to see what he comes up with next. In late October, plans were being finalized with a variety of other manufacturers to produce versions of Miner 2049'er for all of the most popular home computers and video game systems. Look for adaptations of Miner for the following: Apple II, TI 99/4, IBM-PC, TRS-80, VIC-20, ColecoVision, Atari VCS and Atari 5200. Owen Linzmayer is a frequent contributor to Creative Computing magazine.